Hull City have completed the signing of former Paris St Germain defender Bernard Mendy on a three-year contract. The 26-year-old, who was released by the French club at the end of last season, was a reported target of both Werder Bremen and Sampdoria. Mendy spent the 2002/03 season with Bolton Wanderers, where Hull manager Phil Brown was assistant boss. "I'm happy to go back to England. The sporting project is ambitious and interesting," Mendy told L'Equipe. "I'm happy to go back to England and above all I'll be meeting up again with Phil Brown, who was the assistant coach at Bolton when PSG loaned me out there. That counted a lot. "The club are searching for other French footballers and have signed Geovanni from Manchester City." The former France international started his career at SM Caen before joining PSG - the club he supported as a child. 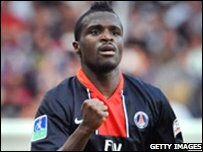 He has made three appearances for France and had featured nearly 200 times for PSG.